That Sfax driver is used for quickly faxing out documents you have stored on your Windows personal computer. 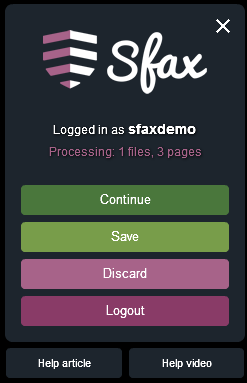 If you are looking to view or manage your faxes however, you will need to log in to the web portal at: https://app.sfaxme.com. We also suggest you watch the 60 second “Sfax Print Driver video”. 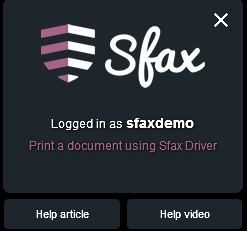 Clicking on the Sfax Driver icon under your installed Programs, or printing to the driver will take you to the log in screen. 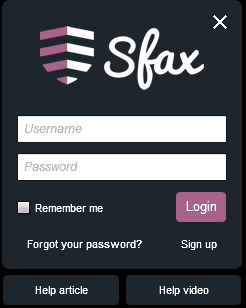 Enter the same Sfax user name and password that you use when logging in to the web portal. The “Remember me” option will keep your account logged in after you are done using the driver, and will automatically log you in whenever you print to the driver again. For a quick, 60 second video on how to use the driver, you can click the “Help video” button. The “Help article” button brings you to this article. You are now logged in to the driver. 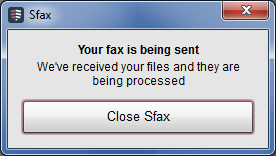 If you are seeing this screen, click on the X to close and then proceed to the next step: Printing to the Sfax Driver. 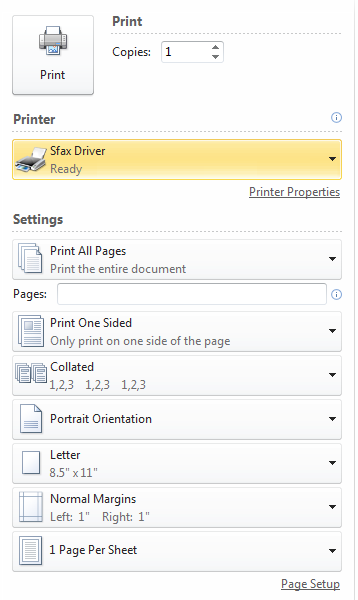 With the document you want to fax open, you will select the print option and print to the Sfax Driver. If you are printing a large document, it may take a minute to process. Once the background processes are complete, you will either need to log in, or select the next step in the process. Here you will see the account you are logged in as, as well as how many files and the total number of pages you are faxing. If you have multiple documents to send, you may leave this window open and print your next document. When you do, you will see your number of files and pages rise. If you click the “X” on the top right, you will be asked to Save or Discard your files. Continue: This will bring you to the next step: Composing your fax. Save: This button allows you to save your current batch of files and pages and either add more documents, or close the program and fax later. This option will close the program. Discard: This button will remove all currently held documents for processing. If you are unsure what files the program is holding to process, or if you mistakenly printed to the Sfax driver, this button will clear these files and close the program. Logout: This button will log you out as the current user noted above and allow you to log in as another account. Your Processing files will be held as you change the account you are logged in to. Once you have selected “Continue”, you will be brought to the home composition screen. To send your fax, you will be working your way down the left hand side of the screen (1). The right hand side (2) will show your documents. The top bar (3) shows your editing options. You will first need to select your outbound number. The drop down will list the numbers available to your account. If you have none attached to your account, you will not be able to send out your fax. Next will be your recipients. You can enter a fax number in the top line. Selecting Add, or pressing enter will add it to the list of recipients you will send to. The box will also auto populate with any contact information that matches the number or text you type in. For instance if you have a contact named “Home”, typing home will pull up the contact matching that information. Selecting “Show contacts” will open your contact list, where you can select the contacts you wish to send to. Once you’ve selected your contacts, click “Apply” to add them to your list. You can also create a new contact in this screen. Next you will select an optional cover page. The default cover pages and any custom cover pages will be available here for you to choose. Enter your subject, reference and remarks you wish to be delivered on the cover page. Remember, never pass protected health information (PHI) through the cover pages. Once all of that information has been filled out, you have the option to either Save, Discard or Send. If you step of the Home screen to a different application, your documents will be automatically saved and the Save option will be grayed out as shown below. Save will only be highlighted if you’ve made changes to the documents you are sending, such as annotations, rotating or removing pages. Click this to save your work if you choose to leave and continue later. Discard will delete the documents and close the program. The following prompt to verify discard will be displayed if you go to File > Discard. Send will process and upload the documents to send. 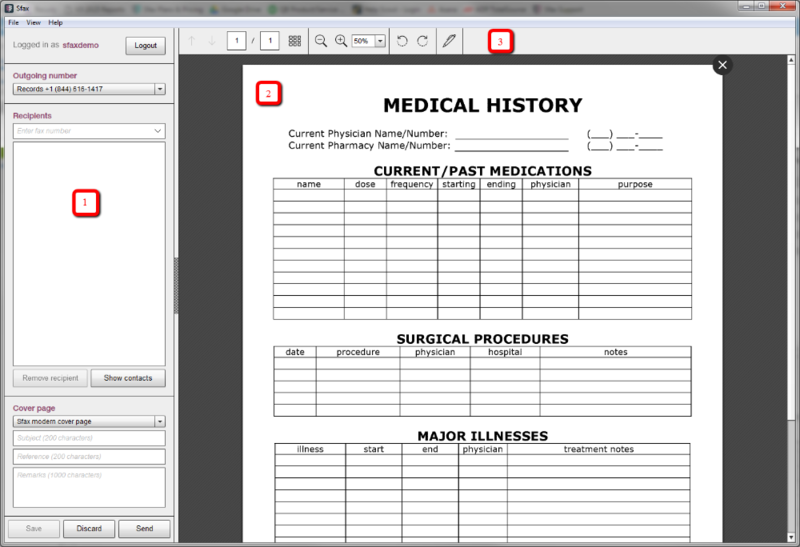 The edit bar shows the options available for working with the documents you have uploaded. Up and down arrows will change the pages that you are reviewing below. 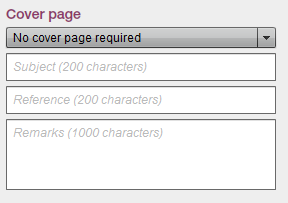 You can also type the number of the page you wish to view. The thumbnails option will show all of your pages in a tile view, allowing you to easily remove or rearrange pages you do not wish to send. A pen icon at the bottom left corner of the page indicates that page has been annotated. You can scale the current image for easier viewing, as well as rotating the pages if they are facing the wrong way. At the top right hand corner will be a black “X”. Click this to remove the page from being processed. 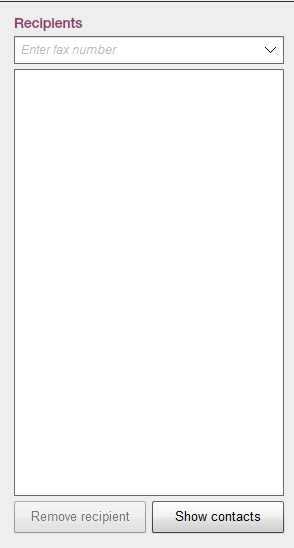 The page will grey out to inform you that it will not be sent when you click the “send” button. You can add the page back in by clicking the circular arrow to restore the page. The Contacts screen allows you to select contacts to send your fax to, or to edit and add contacts in your account. The New button will allow you to add a new contact. At a minimum you need a Fax number, a first name, and a contact type. Select whether you will be saving your contact under your contacts or shared contacts. Once you are done, click next, and you will be able to select the group in which you will be saving your contact. And clicking Save will save the contact in your list. My fax will not send! 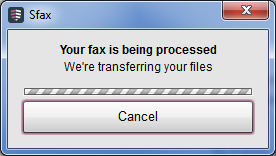 If your fax shows that it is processing, but stays on this screen. You may not have an outbound number selected, or you may not have an outbound line available to you to use. You or your account administrator will need to assign an outbound number to your account before you will be able to fax out using the Sfax driver. 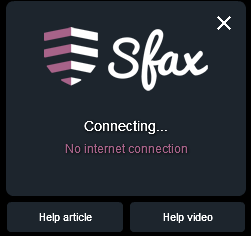 I am getting a No Internet connection error, but I can browse to any website. Sfax will use the Internet Explorer settings to communicate with our servers. If Internet Explorer or Safari is using a Proxy, or is locked down by security settings, you may not be able to use the print driver because of these restrictions. Have your local IT contact us if they have any questions regarding this by emailing support@sfax.j2.com.